Date: Month: Select--> January February March April May June July August September October November December Please select a month. Year: Select--> 2014 2013 Please select a year. Boating Safety Division, Recreational Boating Product Assurance Branch releases spring 2019 issue of the Boating Safety Circular. Boating Safety Division, Recreational Boating Product Assurance Branch releases spring 2018 issue of the Boating Safety Circular. Kidde has issued a product safety recall on two styles of Kidde disposable fire extinguishers. See Safety Alert No. 12-17, Don’t be inflamed about what you have to do! Kidde has made this extinguisher recall and replacement easy for you. The U.S. Coast Guard has issued updated Recreational Boat Flotation Standards for Outboard Engine Weight Test Requirements. Coast Guard announces Notice of Funding Opportunity (NOFO) for the National Nonprofit Organization Grant Program. The U.S. Coast Guard's Office of Auxiliary and Boating Safety released the Strategic Plan of the National Recreational Boating Safety Program 2017 to 2021. You may find the new plan on the About Us Page. The Coast Guard reminds boaters of the importance of performing periodic maintenance on their inflatable life jackets. See Safety Alert No. 13-16, We're Not Inflating the Importance of this Message. Check for Problems Before Your Life Depends on it! The Coast Guard reminds boaters to routinely check their lifejackets to ensure they are in serviceable condition. See Safety Alert No. 07-16, Stem to Stern, Foam to Dust, Inspecting Your LifeJackets is a Must. The Coast Guard strongly urges the public to be mindful of ridesharing services for boats as the conditions of the arrangement determines which laws and rules apply and if the boat operator is required to be licensed by the Coast Guard. See Safety Alert No. 05-16, Enjoying the Waterways in a Safe (and Legal) Manner. The Coast Guard has withdrawn the Certificate of Approval (160.037/23/0) for NAMMO LIAB AB Orange Smoke Hand Distress Signal, and the approval status of this certificate is now marked as "Former- Do Not Use." Datrex Inc., of Kinder, LA, is the only distributor for these products in the United States. Any signal manufactured after October 2013 must be properly disposed of and replaced with a product that satisfies the vessel's carriage requirements. Don't Fear Steer Clear of dredge Equipment Hazards - This safety alert reminds recreational boaters and commercial vessel operators to use caution when operating their vessels near areas where dredging operations may be taking place. Garmin has recently discovered a software issue on GHP Reactor autopilots. This issue may cause the autopilot to perform poorly, up to and including making the unit inoperative. In rare circumstances, the autopilot may behave unexpectedly, possibly performing abrupt maneuvers, although no such behavior related to this issue has been reported from installed systems. The U.S. Coast Guard is concerned about the sale and availability of unapproved recreational and commercial vessel navigation lights. Purchasers of such lighting should be aware replacement lighting may be improper for its application due to the failure by manufacturers to meet technical certification requirements. Furthermore, technical advances in marine lighting, such as the use of Light Emitting Diodes (LEDs), rope lighting, underwater lighting, and other various types of decorative lighting, may violate navigation light provisions of the Nautical Rules of the Road. Request for public comment on draft Recreational Boating Accident Reporting Manual. 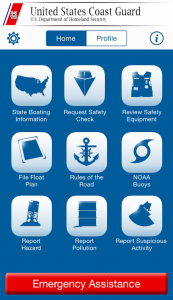 The U.S. Coast Guard has launched a new app for Boating Safety. The app provides essential services and information most commonly requested by boaters. Fall 2014 issue of BSC has been added to the BSC section of the website. The U.S. Coast Guard announced that they have awarded 24 competitive grants totaling more than $4.8 million for recreational boating safety initiatives. Mustang Survival has recalled the MRD100/MRD101 Rescue Stick. There is an update for more information regarding the follow Items: Release of Propeller Guard Test Procedure Report; Bare Hulls; What Are They; Kit Boat Manufacturers and Coast Guard Safety Standards and Regulations; Sale of Foreign-Built Boats by Importers; Recreational Boat Factory Visit Program; Coast Guard Manufacturer Identification Code Database; Websites of Note and Recalls. Currently the National Vessel Documentation Center (NVDC) is operating with an approximate 4 month backlog on Recreational Vessel Initial and Reissue/Exchanged Certificate of Documentation. On the water, safety is priority number one. As part of their preparations, boaters need to make sure that they have the latest NOAA nautical charting calendar on hand to avoid groundings or accidents while navigating along the coast. With modern technological advancements, obtaining the latest charting calendar is easier and more important than ever. The U.S. Coast Guard has released its Report on the 2011 National Recreational Boating Survey. This report focuses on overall boating participation, boat ownership, types and amount of time boats are being used nationwide. With this data, we will be able to implement, refine, and measure the success of the strategies we employ in creating an improved boating environment nationwide.